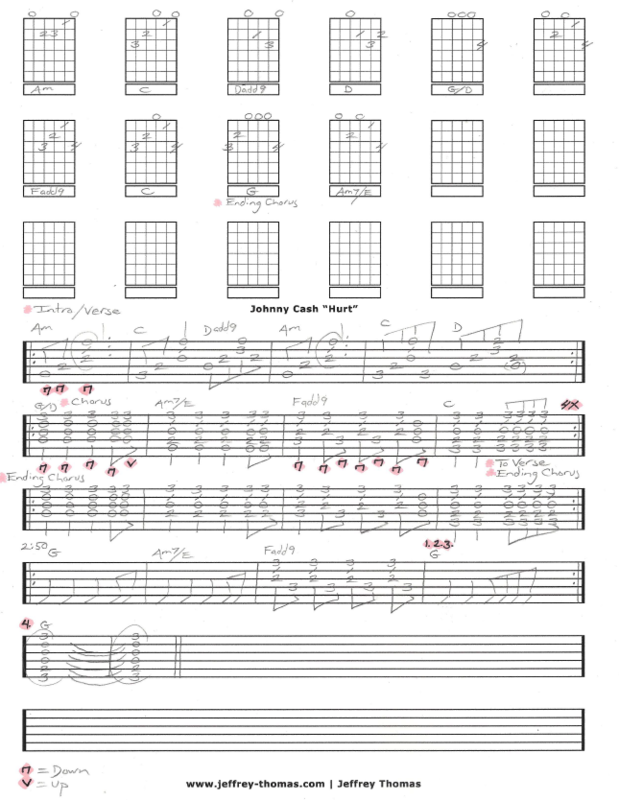 Johnny Cash Hurt Free Guitar Tab by Jeffrey Thomas. This free guitar tab for “Hurt” has the right chords and song structure and picking details so you can play it right. What a great song for Johnny to interpret! This tune gets requested a lot from my guitar students. I’m am glad to have a solid arrangement to offer. Want the full guitar tab for free? Just enter your email address in the form provided. Looking to improve your acoustic guitar skills? Make sure to fill out the Schedule A Free Lesson form to set up your free Skype guitar lesson. The story is Trent Reznor of Nine Inch Nails was asked by Johnny if he could cover “Hurt” and Trent was hesitant but once he saw the final video to the song he became a fan of Cash’s version. Check out more free online guitar lessons on my tab, video and blog pages.